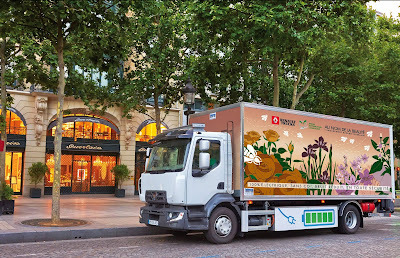 As part of its research into goods transport based on sustainable development, Renault Trucks and Guerlain are currently testing an experimental all-electric vehicle operated by Speed Distribution Logistique. This 16 t vehicle will be delivering supplies to Maison de Parfums & Cosmétiques boutiques in Paris over the next two years. It generates no polluting emissions or noise nuisance and will be tested on regular, demanding delivery rounds of over 200 km. Committed for many years to the principles of sustainable development, Guerlain and the Paris region carrier Speed Distribution Logistique have joined forces with Renault Trucks to test a 16 t all-electric experimental vehicle under actual operating conditions: the 100% electrically-driven Renault Trucks D.
This truck will be carrying out daily deliveries to the Guerlain boutiques in Paris from its distribution centre, covering over 200 km. 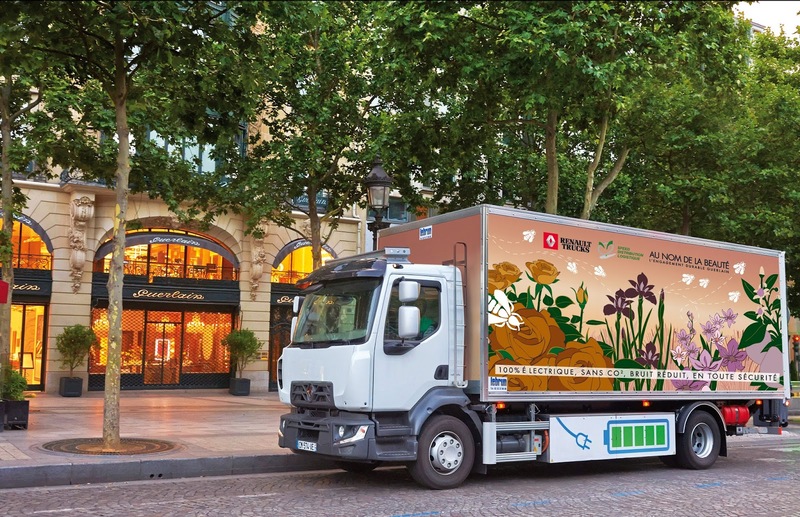 To operate over such a long route, a first for any electrically-driven vehicle, the Renault Trucks D all-electric will recharge its battery several times during each 24 hour operating cycle. Its route has been planned so that it can carry out two partial recharges during the day and a total recharge between 7 PM and 2 AM. The test is scheduled to run until the end of 2015. A full appraisal will then be carried out and added to Renault Trucks’ expertise in the field of electrically-driven medium tonnage vehicles and its customers’ requirements. This will then be used to determine the direction future research will take. For Alexandre Oulès, director of operations and Philippe Bernard, logistics manager at Guerlain, becoming jointly involved in this unique programme was an obvious choice. For Guerlain has made sustainable development part of its strategy for more than seven years, focused on six major challenges which include a determination to reduce the level of CO2 emissions generated by goods transport. It was also an opportunity to work with Renault Trucks and Speed Distribution Logistique on an innovative project, based on a joint commitment to protect the environment.